We are truly lucky to have some fabulous shows come to the Merrill Auditorium in Portland. We've taken the little C&Gs to see Winton Marsalis, Blue Man Group, Potted Potter, and Stomp. 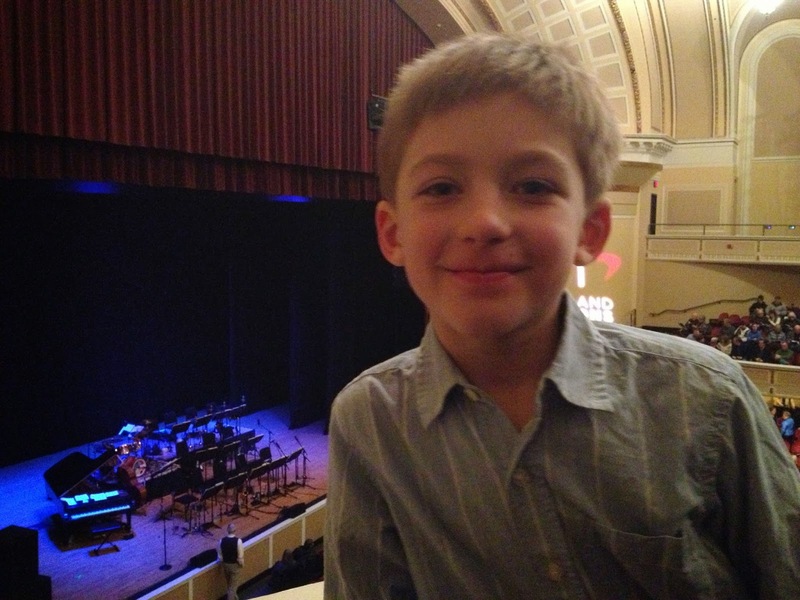 The Portland Symphony Orchestra also puts on quite a bit of children's programming, and we've also gone to see their open rehearsals, free and open to the public. The little C&Gs have some favorite pre-theater dinner spots within walking distance to the Merrill Auditorium. But busy Friday nights in downtown Portland can make dinner reservations (and parking) tough, and add in a popular show at the Merrill and it's almost impossible. Thanks to OpenTable we booked a last minute table at the cavernous Grace restaurant before going to see the Blue Man Group. Grace is on the same block as the Merrill and a short five minute walk makes it a perfect pre-theater spot. Its a spacious open concept restaurant built into a renovated former church and popular for events (a no-brainer for a wedding reception) or an elegant grown up night out. But it never occurred to me it would be a fun place to bring the kiddos. The little C&Gs loved Grace and it was surprisingly very kid friendly. 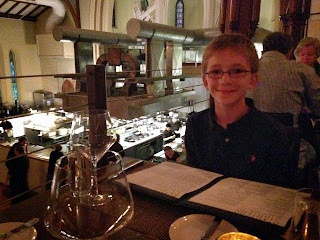 The boys were totally entertained by watching all the action in the busy kitchen down below (ask for a table on the second floor balcony) and the waiter offered them several kid friendly options not on the menu. They ordered some cheese and charcuterie to start the evening off while Mr. C&G and I ordered drinks from their creative and biblically themed cocktail menu. Dinner at Grace was delicious, totally fun and a great place to go with your dressed up kiddos, pre-theater or not. Big C&G kept a close eye on his watch and we made it around the corner to the show with plenty of time to spare. And the Nobel Peace Prize Goes To . . .
And the Nobel Goes To . . .